Halibut is a large Pacific ocean fish that can grow to 8 feet in length and weigh up to 700 lbs. 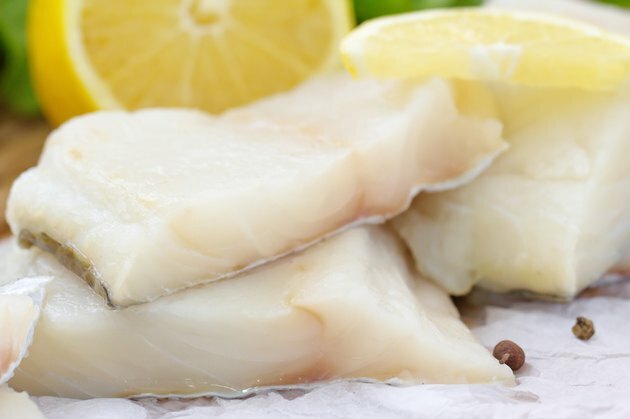 The meat of the halibut is white and flaky, with a solid texture. You can usually find halibut at the fish counter in grocery stores, or in specialty fish shops. The oven and stovetop are common cooking methods for halibut, but grilling is also an option. Grilled halibut takes on some of the smokiness of your barbecue and the signature grill marks enhance the presentation on the plate. Turn your barbecue on to medium-high and oil down the grates with vegetable oil on a clean cloth. Season the halibut fillets or steaks by sprinkling both sides with salt and pepper. Place the halibut on the grill, with the skin side down if the fish still as the skin on. Close the lid on your barbecue and cook the halibut for roughly four minutes. Flip it over and cook for four minutes on the other side. Remove the halibut when the meat flakes off easily with a fork. Make a sauce or vinaigrette with lemon juice, onion, garlic or white wine and drizzle over the fish for added flavor. You can also add a sauce or marinade before the fish goes on the grill.